Last year, I bailed totally on getting any sort of reading list up. This year by gum, I'm determined. I'll also get a Summer Reading post for grownups up, I will, I WILL. Intention is half the battle right? If I really get the fire going, I'll try and get a picture book summer reading post up as well, but let's not count our chickens. I've got a 10 year old girl and so this year, I'm throwing up a list aimed at the 8-12 year old ranges. (At least that's what Amazon tells me. So if you hate these and/or find them inappropriate in any way.....go take it up with Amazon, ha ha ha! I'm so helpful.) I haven't read these ~ some Julia has asked for after seeing them at the bookstore, some I came across online, and as always - if the cover looks cool, well you've pretty much sold me. I'm simple that way. So let's see what we have, because I've already forgotten, we can look together! A lot of these were just released this 2016 spring. This will be a fun game, yes? Guessing which books I chose for the covers? I'll give you a clue - ALL OF THEM LOL. But especially 'Summerlost', by Ally Condie. (who wrote 'Matched', which I very much enjoyed and I fully intended to read the whole series, but then I didn't.) THAT COVER. 'Tis so so awesome. Honestly if they were trying to convey Judy Blume nostalgia, they nailed it. And I adore the title. This one is about a girl, Cedar, who moves back to a small town in the summer after the death of her father and brother, whereupon she meets a strange costume-bedecked boy who's working for the local Summerlost theatre festival. Part of the plot touches on a mystery surrounding the life/death of a Hollywood actress who supposedly haunts the festival. I'm sold. 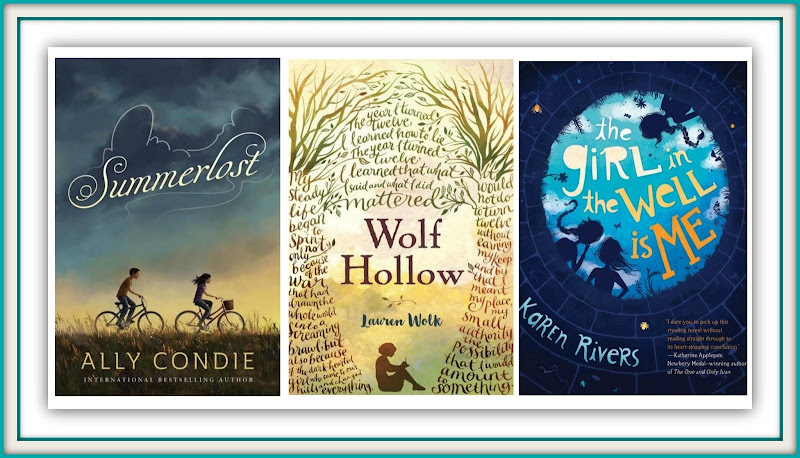 'The Girl in the Well Is Me' by Karen Rivers is another whose cover sold me. But when I read the premise, I was really intrigued - a girl falls into a well during a 'popular kids' club initiation (seriously, why are kids so terrrrrrrrible????) and spends hours revisiting elements of her life - the book travels back and forth in time as Kammie (the well girl) ponders the state of her life thus far. When a hallucination induced French-speaking coyote was mentioned, I knew that this book had to go on the list. Aaaaah this next one - LOVE THE COVER! 'Paper Things' by Jennifer Richard Jacobson is another book with an intense sounding storyline - this time tackling the issue of teen homelessness. From 'couch surfing' in friends' apartments to juvenile shelters, the story tackles a girl's course as she tries to both remain with her older brother, as well as excel enough in her studies to gain entry to a middle school for the gifted. 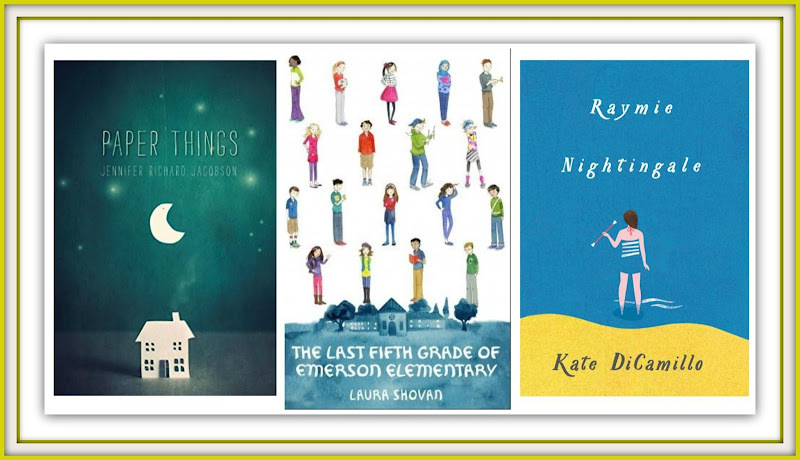 'The Last Fifth Grade of Emerson Elementary' by Laura Shovan sounds cool and again - loved the cover! This is neat - a novel-in-verse depicting the poems written by a 5th grade class. The poetry will be placed in a time capsule, during the last year of an elementary school facing closure, as plans are afoot for a shopping mall to take the school's place. The poems also reflect the personal events going on in the children's lives. AND LAST we've got the great Kate DiCamillo's newest offering, 'Raymie Nightingale', which follows a little girl's attempts to win a Little Miss Central Florida Tire competition. And I think that's all I need to dangle in front of you about that one. I'm hooked already. ~this post contains a whole crap ton box load of affiliate links. Miss C. Is knee deep in old books these days. She reads a lot of Nancy Drew and we are currently reading the third Anne book (Anne of the Island) together. She's not quite a tween at almost nine but getting there! Oh, and she is eagerly awaiting the second installment of the Illustrated Harry Potter books. aaaaaaah, I was thinking I was going to hold out until J was 11 before starting Anne, because I was 11 when I got my first Anne book, but.....I might have to throw in the towel. I'm chomping at the bit. I think this summer, we're going to read The Hard Winter (ha ha ha seasonal eh?) because that's where we are in the Little House series. We read several in a row and then took a breather. I'm feeling the call to get back into it! Oh my goodness you must start the Anne books! I've been reading them to her - it's really the only way since the language is too sophisticated for her reading level. But she looooooves them and begs me to read them all the time. It's really a good series for mothers and daughters to read together, especially for girls as they grow. Anne is such a wonderful model for girls to emulate! you are right. you are right! going to get a brand new set and start asap!